How Sprawly is the Unitary Plan? There has been a great deal of emphasis on the zones where higher buildings will be allowed in the media coverage of the Unitary Plan. Especially giving voice to those who see this as unwelcome. Yet the plan isn’t by any means only about Auckland ‘growing up’, it also includes the quite substantial expansion of the current city limits. So I thought it might be useful to have a look at this side of the plan, particularly in order to try to get a sense of the likely character of the future city. 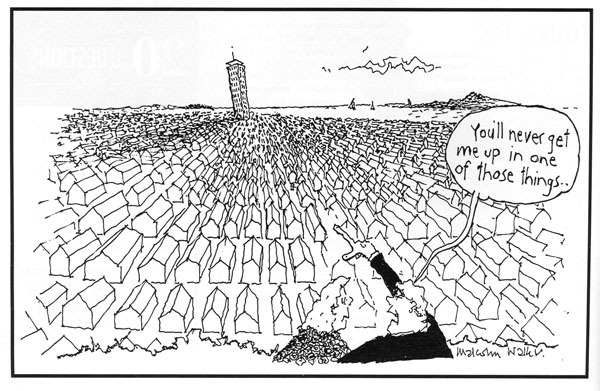 Will Auckland still be a place where people with the attitudes of the man in the cartoon below will still be able to fit? This chart says there are currently 20,000 sites ready to go outside the existing MUL [Metropolitan Urban Limits] and 50,000 properly rural sites plus 90,000 new ex-urban greenfields new suburban ‘sprawl’ sites adding up to 160,000 sites for new low rise detached dwellings in [potentially] leafy environments proposed under the new plan. This is to complement an identified additional capacity for some 280,000 dwellings within the existing MUL. These of course will not by any means all be apartments, it includes for example the current conversion of the Manukau golf course into new low rise suburb of detached houses by Fletcher Building. The proportion of occupied dwellings that are separate houses appears to have declined slightly during that time, while the proportion of flats, townhouses and apartments appears to have increased from 21.7 per cent in 1996 to 23.9 per cent in 2006. The bulk of these multi-unit developments have been in the CBD, with other significant higher density housing in areas in the periphery of the CBD e.g. Newmarket, Mount Eden and Grey Lynn. Other centres in the region are also seeing higher density development such as Henderson, Papakura, Takapuna, Botany, and Albany. Looking ahead to 2041 will 1 million more people require say 300 000 more dwellings? And even if we assume the bulk of the new dwellings are of the attached typology, say 2/3, we are only looking at shifting the balance from about 24% to 38% of the total. Auckland in 2041 under the Unitary Plan as it is now will still predominantly be a place of detached houses. Especially because as observed above the attached dwellings will remain in a small number of places and, of course, because these places will be more densely occupied by definition, they will cover a much smaller area of the city than will the detached housing. Of course it is important to note that it is those that are happy to live a more urban existence that will enable Auckland to grow yet preserve whole areas of existing low density suburbia. Somewhat ironically. And only if there are some areas where greater density and higher buildings are allowed. Of course a great deal will no doubt change over that period so whether the population does grow this fast and how people will choose to live is, of course, uncertain. But it is pretty clear that there is nothing particularly radical in the Plan in terms of restricting the future of Auckland in any one direction. If anything it just continues the recent gentle increase of ‘city-like’ habitation in Auckland. In other words Auckland is slowly morphing from having a big town nature towards having more city like characteristics, but slowly. This seems likely and natural and not unlike what has happened in Sydney and Melbourne. My personal view is that it would be a poor outcome if all of the land identified for possible greenfields suburbs got developed in the way we have been, but it is certainly possible under this plan and it may be. Likewise I would prefer to see more intensification in selected areas, but it is clear that this is by no means certain under the plan. It will depend mostly on people’s desires, as expressed by the market. It will be interesting to see, as this century unfolds, whether Auckland continues the international trends already observable here and best summed up in this book. Whichever way Auckland grows, and my guess is it’ll probably be both up and out, I just hope that we do it better with more local walkable and compact centres and much better transport options than we bothered with until recently. 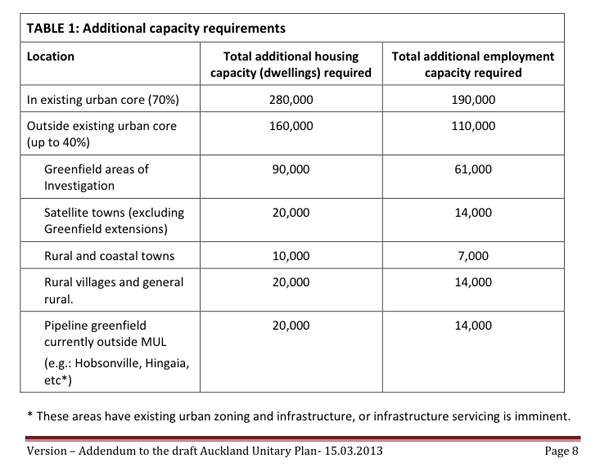 And it does seem that on balance the Unitary Plan goes some way towards making these improvements more likely. Now, if we could just get a much more rational approach to transport investment by central government then this plan will go a long way towards building more successful communities of all kinds in our biggest city. Considering the development strategy pre Auckland Plan was to contain all growth to 2040/2050 within the 2010 urban limits, with just a few extensions, the changes to this in the past couple of years are massively more weighted towards urban sprawl. Another 160,000 dwellings outside the current limits. That’s bigger than Wellington or Christchurch! Auckland is already a sprawling mess and I am pleased to have moved out. A definite urban boundary needs to be set about where it is now and a true green belt created for say 20kms. i.e. NO new dwellings at all. Satellite towns should be developed such as Helensville and high speed public transport should be built to these towns….no motorway connection of course. The new towns should have their own limits and green belts. You would then know where you are with zoning and land would not be left in limbo in “land banks” or what ever the terrible term is. In Europe cities are contained and more functional. Sprawling bungalow structures actually do not make as attractive a street-scape as 2-3 story structures provided there are green spaces and plenty of trees. Areas such as Karaka and the like should never have been built and this productive land left as rural. Unfortunately, other NZ towns are following the Auckland sprawl model but at an earlier stage. I’m not up to speed with all the plans – I’ve only glanced at them recently. However, I do want to suggest that household sizes have been decreasing for quite some time, for a number of reasons. New Zealand’s population is aging, and older households are more likely to consist of one or two people. Similarly, age of first child among women has increased and then remained high; which means less children in households over women (and men’s) twenties and less people in households when children do arrive, and various non-traditional household arrangements have normalised. It’s a pity that the census process is so slow, as we need this information to adequately project forward from where we are into the future. I’d say an assumption of 3 people per dwelling is on the high end. If the number is less than this, the number of dwellings will increase dramatically. Most of the numbers use an average household size of 2.5 people. That is, 1 million people = 400,000 dwellings. I can’t see that much sprawl happening.There is room for it in the plan, but I would be very surprised if it got built. Has anyone checked in the unitary plan whether the proposed higher density growth nodes align with the rail and high frequency bus network? In essence, whether the unitary plan land use is truly integrated with our current understanding of the future of the transport network. It would make for an interesting post and doesn’t appear anywhere else i can see. I can recall one example of a big growth node out near One Tree Hill which isn’t currently serviced very well by the PT network. I can’t access the plan from home so would like to see some more analysis on this subject. Sorry if not the place to post a Q. Anyone?? It seems pretty good. Most metropolitan centres are on either the existing or proposed rapid transit network. Takapuna is the only exception. Most areas proposed for mixed use or apartment/terrace zone seem like they’re on frequent bus routes or around train stations. Only exceptions seem to be more recent areas like Flat Bush and Stonefields where you have higher densities in the wrong places. Anyway the two are really joined at the hip and subject to influence; we can choose to intensify well connected areas that are underdeveloped and improve connection to important areas. A central point of planning, surely. Just a comment on “Rural” zoning under the Unitary Plan. Under the operative Franklin District Plan in the Rural zone a second dwelling on a lot less than 40 ha in area is restricted as a Restricted Discretionary Activity to a granny flat or a workers cottage. Any other dwelling is Non-Complying, and unlikely to get consent. Under the Unitary Plan a second or third or fourth dwelling on a rural lot of any size will be Discretionary with the main assessment being it will not visually offend the neighbours. If you own a rural lot and can get your neighbours to approve your plans you will be able to construct several rental dwellings on your “Rural” lot. I would think it will be a case of I’ll scratch your back if you scratch mine. I would expect every rural road in the former Franklin area will be a classic example of ribbon development in a few years. It would seem to me that the southern urban boundary will be the Waikato District. Lloyd, I think you’ve hit the nail on the head. To create a vacant site within a rural zone currently is Non-complying, whereas now under the new plan it is Discreationary. Does this mean neighbours consent is needed or what? – regardless, it seems the council are signalling vacant sites if you can gain approval from surronding parties. This is massive and it has defiantly has been overlooked by followers including this blog, as it would seem sprawl is un-limited to particurlar rural zones. What is of more interest is the RUB areas for investigation, taking Whenuapai for example, under the unitary plan the area is zoned mixed rural while if this land was re-zoned future urban you would be limited to development until structure planning. Do land ownders really want the future urban zone? knowing private money is waiting to cut into 800sqm, possibly no. They may well prefer to keep the mixed rural zone and decide to develop the land themseleves under exisiting structure plans.